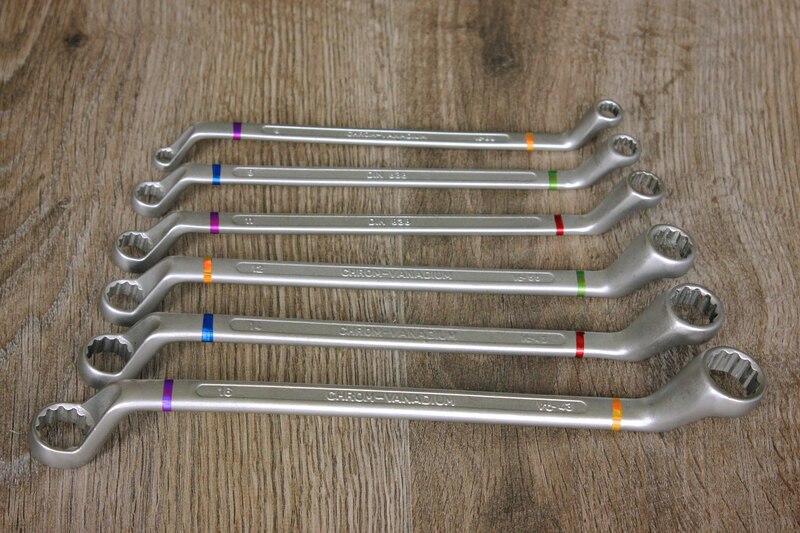 Most tools have their size stamped on there somewhere, but it can be a bit difficult to tell. A lot of time is often wasted trying different sizes until you find the right size. 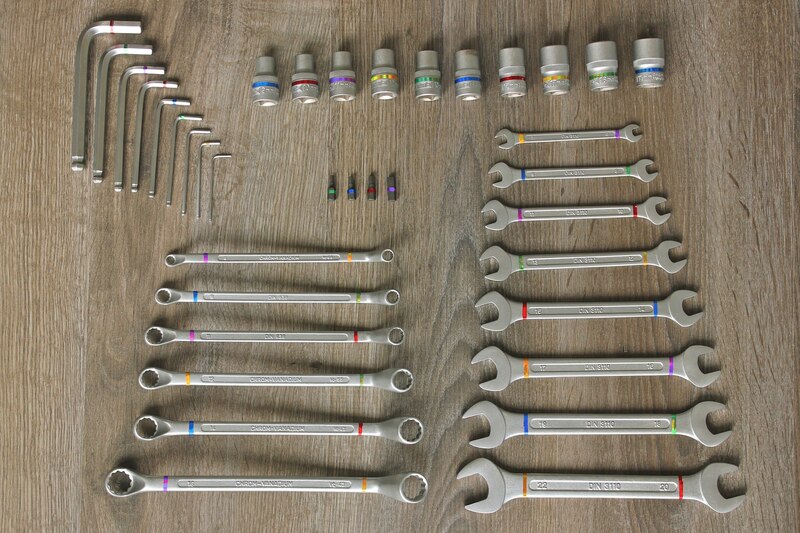 To make it more obvious which size each tool is, color coding tools is an option. Some people use paint, vinyl tape or nail polish. There are different colors, each color corresponds to a certain size. 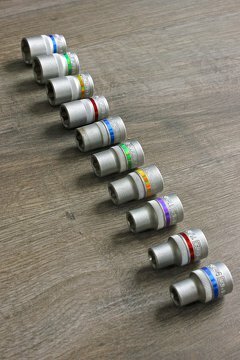 There is an article by Sheldon Brown about color coding tools which I explains the process in detail. 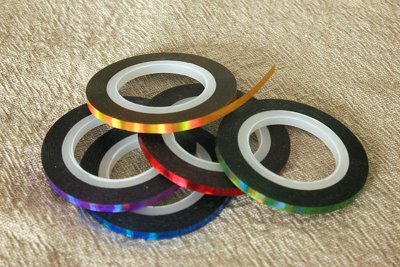 When looking for different colored tape I came across "nail art" tap, which is meant to be used on nails on fingers (and toes?). The nice thing is that it is sold in packages with multiple rolls of different colors. 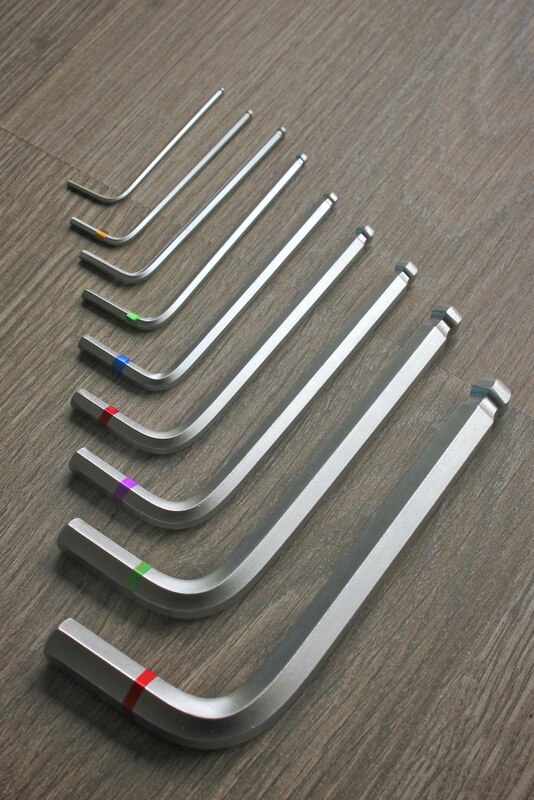 It comes in different widths. I chose the 3 mm wide rolls, small enough to fit around hex bits, but wide enough to be visible from a distance. It only comes in shiny colors. I hope since it is meant to go on finger nails it is also hard wearing. I got seven rolls of different colors, 3 mm wide for about one euro. Applying the tape is a bit finicky. The tape stretches a little bit which allows it to be wrapped tight around uneven shapes. I did have to clean some of the tools, a little bit of grease will really prevent the tape from sticking on the metal. 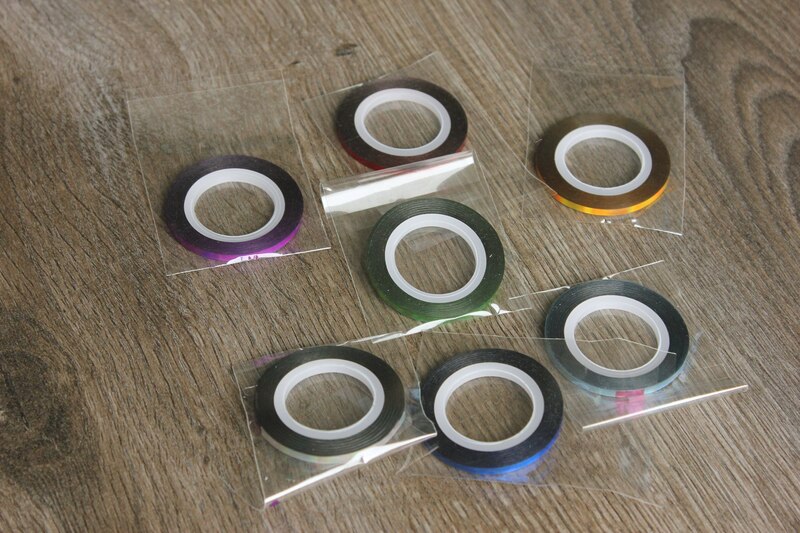 3 mm nail art tape rolls in bags. Pile of colored 3 mmm nail art tape. I am hopeful the tape will stay on the box and open ended wrenches. It could potentially slide off the sockets. 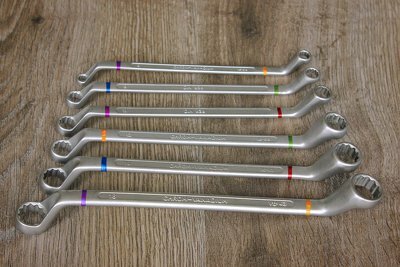 The smaller hex keys and bits worry me the most. There is the least surface area to adhere to. 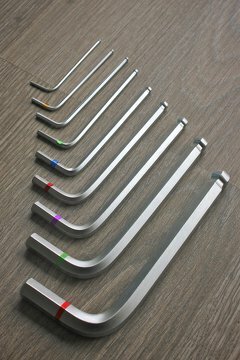 This article will be updated after a while with some of my experiences with using the color coded tools. 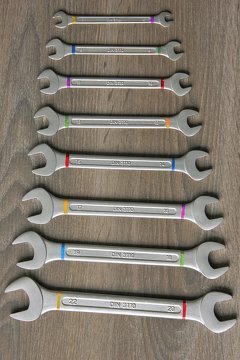 These are some pictures of the various wrenches with the colored tape applied. 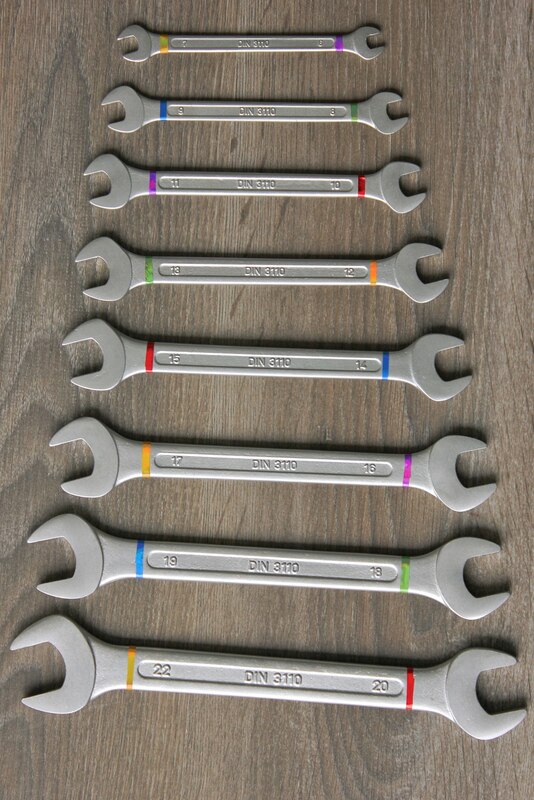 Color coded open ended wrenches. 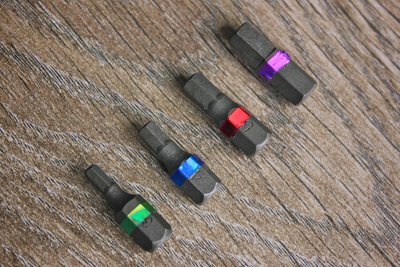 Color coded 1/4" hex bits. Assortment of color coded tools.